Join the discussion on our forums! Come discuss Zilliax over in our dedicated Zilliax discussion topic. Very versatile, perfectly balanced, awesome voice lines. One of the best cards to ever be printed in HS. Perhaps the most versatile, balanced card ever printed. Card design at it's finest, really strong, but not overpowered. Can we have the files for his voicelines please ? I don't own this card so this is just a question for those who do . 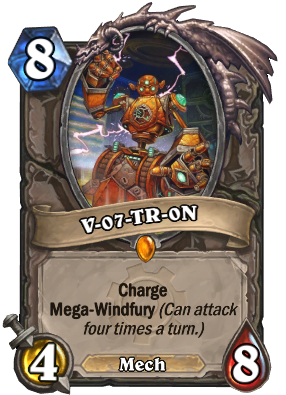 I see alot of taunt warriors using this card with no other mech in ther deck i mean none .Why use it then at all? is the lifesteal that necessery for the taunt warrior that gains shitload of armor. Mainly because it's a Flanking Strike that also gives Taunt. A board swing like that is something aggro doesn't enjoy, even if you don't run other Mechs with it, because vs. aggro he almost always trades 2-for-1. 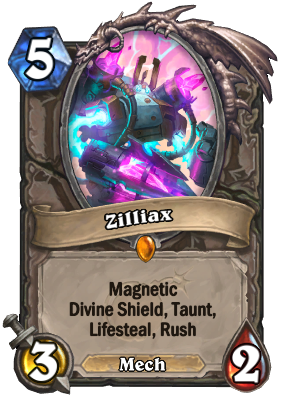 And unlike, say, Witchwood Grizzly, Zilliax doesn't get completely neutered by silences because Rush lets you get immediate value with him. Finally, as hard as it is to believe, sometimes you really do need the lifesteal. Every time I'm either facing a hunter or a warrior who puts down a 2 mana 1/5 Mech with taunt, then they keep using magnetic cards until they get zilliax and the twenty battlecry buffs he gets makes him unkillable without fully healing your opponent. I'm sure the deck is fun to play, but unless you have the same or a similar deck it's just NOT fun to play against. Then how will you vote? Lol at the noobs thumbing you down. They are too blind to see that this card is comparable to a bad spell. Indeed it is. When played alone it is weak. When played on a mech via magnetic, it’s weak.